Recognizing that staying one step ahead of the competition, being progressive in leadership structure, and ensuring that PAs feel valued at their place of employment are all key to how NYU Langone Health is able to recruit and retain talented PAs. NYU Langone has taken several critical steps to ensure their PAs are practicing at the top of their education and experience, and feel invested in the organization. Positioning a PA at the head of PAs at NYU Langone was a game-changer for recruiting and hiring, says John Davidson, senior director, PA Services and Care Management. This led NYU Langone to establish a system-wide approach to recruiting, credentialing, privileging, onboarding, and orienting all PAs. Left to right: Alex Tang, Christina Cundari; PA Manager Neurosciences Nicole Lombardi, Langone Brooklyn; Jarrod Poirier; Sr. Director PA Services and Care Management Transitions John Davidson; Asst. Director, PA Services Christopher Anderson; Sr. PA, Emergency Medicine, Jennifer Spisak, Tisch Hospital; Philip Jocelyn; PA Manager, Surgery Ken Ruiz, Tisch Hospital; Nadzeya Tsytsyna, and PA Manager, Jessica Scott, Langone Orthopedic Hospital. 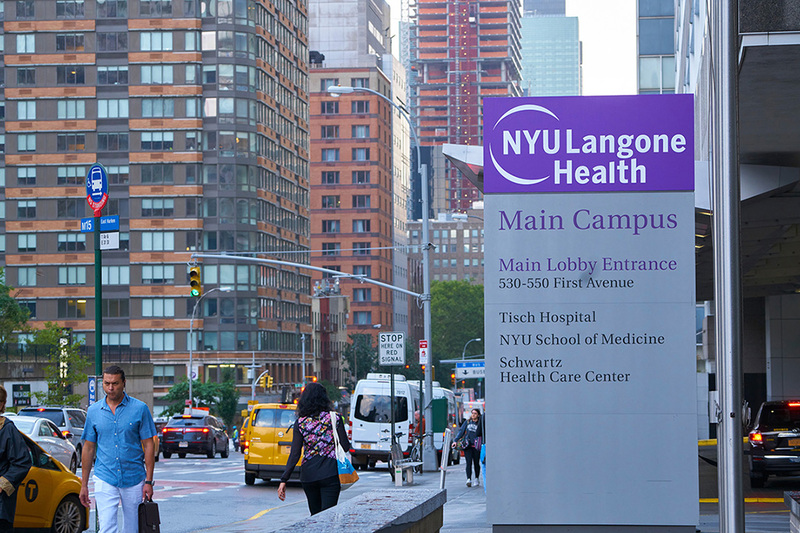 NYU Langone is in Manhattan with additional facilities throughout the New York City area, including six inpatient locations. It includes over 300 ambulatory sites at locations throughout New York City’s five boroughs, Long Island, New Jersey, Westchester, Putnam, Dutchess counties and Florida, and affiliation agreements with five hospitals. NYU Langone was named a 2018-2019 winner of the Center for Healthcare Leadership and Management’s (CHLM) Employer of Excellence (EOE) award in May 2018. Among the EOE criteria exceeded by NYU Langone were: establishing a positive and supportive PA work environment; providing opportunities for meaningful input that lead to positive organizational change; and keeping PAs informed and involved in leadership efforts to improve the quality of care. In addition, it has garnered recognition from U.S. News & World Report as a “Best Hospital” for neurology and neurosurgery; earned a 5-star rating for safety, quality, and patient experience from the Centers for Medicare and Medicaid Services (CMS); and received The Gold Seal of Approval by The Joint Commission, among other designations. According to PA Manager Adam Slevin, NYU Langone has a positive and supportive PA work environment due to a clear and defined organizational structure. Regular PA Council and PA Leadership Council meetings give PAs the chance to network, partner, and make their needs known. The PA Council is a volunteer group of PAs from within the entire health system who meet bi-monthly to address the questions, concerns, and positive aspects of the PAs in the department. To manage conflict, PAs meet daily with other departments during planning rounds to agree on patient care plans. Several PAs are being trained to be peer supporters, empowered to counsel colleagues after cases with poor outcomes. PAs can communicate on a PA Services website, for example. They are encouraged to participate in the “NYU Langone Annual Think Tank” where employees are challenged to offer innovative ideas for patient safety. PAs are acknowledged for their accomplishments with annual awards for top performers. In addition, the PAs’ Social Committee develops team building exercises and events to help maintain a positive outlook. PAs are also encouraged to pursue additional education and professional development through tuition remission and continuing education programs. Farrell describes several monthly multidisciplinary PA/MD education meetings for improving clinical competence and the quality of care that the PA/MD team delivers. Other education offered at no-cost to the PAs are: Advanced Trauma Life Support, the Fundamentals of Critical Care Support, and SIM Lab training. In addition, NYU Langone created an ED PA Fellowship that allows PAs interested in Emergency Medicine to rotate through several specialties and acquire the knowledge necessary to practice in a high-acuity Emergency Department. In addition to the variety of support systems for PAs, NYU Langone is mindful of establishing developed career paths for PAs. PAs are being trained to perform surgical consults and taught procedures to function at a higher level (like a PGY2-3 resident) as the number of residents decreases. NYU Langone started a training platform for high-complexity, low-volume procedures. Slevin had the privilege of being hired as a PA in robotic surgery four years ago. At the time, NYU Langone was one of the first institutions in the country to implement an assist robotic program across the subspecialties of urology, gynecologic, and general surgery. He is personally involved in committees including a Robotic Oversight Committee which includes surgeons and anesthesiologists, members of hospital finance and billing, peri-operative management, and nursing. “The foresight in developing and growing the robotic PA program is one of the many examples of NYU Langone implementing protocols that create a PA-positive environment,” Slevin says. Establishing a positive and supportive PA work environment. Providing opportunities for PAs to provide meaningful input that leads to positive organizational change. Keeping PAs informed of organizational activity and decisions. Involving PAs in leadership efforts to improve the quality of patient care. Creating processes for effective conflict management. Eileen Denne is director of Corporate Communications at AAPA. Contact her at communications@aapa.org.